How skis are constructed can vary quite a lot, although the basic components generally stay the same. Manufacturers use slightly different materials and methods to make their skis, all claiming advantages to the way they do things, but at the end of the day all skis are built to basic principles, which is what is explained here. As shown on the right, the basic construction of a ski has a laminated wood core at its centre. The wood core is surrounded by composite layers above and below and sidewalls to the sides. To this a topsheet is attached to the top and the edges and base are attached to the bottom. The materials and shapes used for each of these layers and components can vary a lot though, below are more details on each part of the construction. The core is the central structure of a ski, which determines a lot of a ski's characteristics. This is where most of the longitudinal strength and stiffness comes from, and is seen as the part of the ski to which everything else is attached to. Most ski cores are made from laminated strips of hardwoods like beech, birch, aspen, paulownia, fuma, ash, fir, maple, spruce, poplar, or bamboo, generally with strips of different woods being laminated together. Wood is used as it gives a lively feel with good vibration damping, it keeps its shape well, and has a fairly low resonance. Carbon - Light, lively, strong and very good under compression, but very expensive. Kevlar - Strong, reasonably light, good under tension, and a good dampener. Aluminium Honeycomb - Very light and strong, but is expensive and has reduced damping capabilities. Fibreglass - Relatively strong, light and inexpensive. Titanium - Very light and strong, with good damping properties, but expensive. Air - When used correctly, air can decrease the weight of a ski core without having any major effect on the core's strength. Foam - If large amounts of foam are used in a core it is often done by using a composite torsion box to create most of the ski's strength and flex characteristics. Wood cores are made of laminated strips of hardwood that run along the length of the ski. The length of the wooden part of the core can vary depending on the type of core but the wood will often run from the tip to the tail. The strips of wood used are normally different woods, arranged in different patterns, and can have areas that use other materials like foam, carbon, or titanium. By using strips of different types of wood in the laminate, manufacturers are able to use the properties of several types of wood in their cores, and can more accurately shape a ski's characteristics. This is done to give different strengths, flexes, and weights to different areas of a ski. The laminated wood strips are glued together and then precisely CNC machine cut into shape. Some ski cores also have ridges and shapes incorporated into the top of them, which can often be seen in the shape of the topsheet. Using these ridges and shapes is another way that different flex, stiffness or weight characteristics that can be given to a ski. The sidewall is the area along the edge of a ski above the metal edge. There are 3 types of construction sidewalls can have, depending on how the ends of the different layers of the ski have been finished. ABS Sidewall / Sandwich Construction - This is where each layer of the ski is flat and an ABS sidewall is put in at the sides to protect the core. 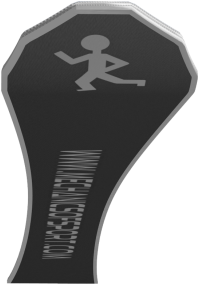 This design is commonly used for racing skis as it transmits pressure to the edges well. ABS sidewalls make skis torsionally stiffer, have better edge grip, and be more resistant to impacts. However they are heavy, and can make skis more easily damaged by the edges when skis cross. Cap Construction - This is where the composite layer and topsheet are brought down over the core to seal the edge. This design makes the ski a bit lighter and generally makes the topsheet a bit less susceptible to damage, due to the curved shape. However the cap construction is not as torsionally stiff giving less edge grip and handling at high speeds. Half-Cap Construction - This is a hybrid of the other 2 constructions where the composite layer comes down around the core, and the topsheet comes part way around to join a smaller sidewall. This design provides good pressure transmission to the edges, and is reasonably light and snappy. Quite often a hybrid-cap construction will be found on skis, with the ski having an ABS sidewall along the middle of the ski, turning into a cap construction at the tips. The sidewalls used are generally made of ABS plastic, often having layers of rubber underneath to help absorb shocks, and can also have layers of other materials like aluminium, and bamboo. Where the sidewalls have ended at the tip and tail of a ski, the core is protected by a plastic tip wall. The composite layers are where most of a ski's torsional strength comes from. These layers go above and below the core, both protecting the ski's core, and adding new strengths and properties to a ski. There are many different types of composite that can be used for these layers, most commonly fibreglass is used, but composite layers using carbon fibre, kevlar, and titanium are also common. 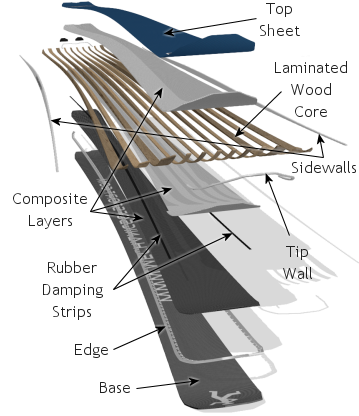 Often several different composite layers are used, each made of different materials. 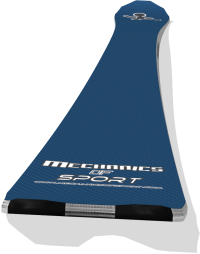 As with ski cores this enables the strengths and properties of several different materials to be utilised, and the properties of a ski to be further enhanced. Bi-axial wrap - In bi-axial wraps the glassfibre strands are weaved together at 90° to each other, this produces a lightweight, dependable and forgiving layer. Tri-axial wrap - In tri-axial wraps the glassfibre strands are weaved at +45°, 0° and -45°, this again produces a lightweight, dependable and forgiving layer but with increased torsional stiffness and response compare to the bi-axial wrap. The fibreglass sheets are impregnated with resin, which holds the them together and gives them their strength. The topsheet is the layer you see on the top of a ski. This is where the graphics are contained, and it is also a protection layer for the inner parts of a ski. Topsheets are normally only a couple of millimetres thick and can be made of many different materials including nylon, wood, fibreglass, plastic and composites. Encapsulation - Here the graphics are printed onto paper, cloth or a similar material and put under a clear top sheet, or a clear lacquer on the topsheet. This leaves the graphics underneath or inside the topsheet, but able to be seen through the topsheet material. The materials and inks used are chosen carefully, otherwise they can affect the bond between the topsheet and the composite layer underneath. Sublimation - Here the graphics are fused into the materials that make the topsheet using special inks, suitable plastics and heat. This leaves the graphics as part of the topsheet, with the colours going all the way through the material so that even if the topsheet gets scratched the graphics will still be there. Bases are made of P-Tex a polyethylene plastic. Most base materials will be followed by a number (i.e. sintered 2000). This number refers to the molecular weight of the polyethylene. The higher the number is the higher the molecular weight of the P-Tex is, which indicates a better and more durable base. Extruded - This is where the base material is melted and then cut into shape. Extruded bases are cheap to make and low maintenance, but are less durable, and slower. They are smoother and less porous so don't absorb so much wax, but if the base is left unwaxed, overall performance is not affected so much. Sintered - This is where the base material is ground into a powder, heated, pressed and sliced into shape. Sintered bases are more expensive to make, but are more durable and faster. They are very porous and absorb wax well, but will lose performance if they are left unwaxed, and are more difficult to repair. Sintered bases can also have graphite and other materials in them, this makes them even faster and more durable. Graphite is added because it is conductive. As a ski slides static charges form between the base and the snow which increases friction. The graphite helps dissipate the static charges, reducing friction and making the base faster. Graphite bases can also hold even more wax than normal sintered bases, which again makes them even faster. 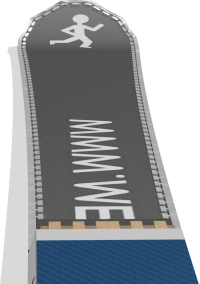 The graphics on bases are generally put there by either having the graphics printed on a layer above the base layer, with a clear base material to see through to them, or by having a base made of pieces of different colour P-Tex that are precisely cut by machine to fit together. Ski edges are made of steel or stainless steel, and are held into the ski with T-shaped inserts which sit between the lower composite layer and the base. There are 2 types of edges, full wrap and partial wrap. Full Wrap - In full wrap edges one length of edge metal goes all the way around the ski and joins at one end. This is the strongest type of edge for a ski, although it can be hard to repair if damaged badly. Partial Wrap - Partial wrap edges are where the edges just run along the sides of the ski where the sidecut is. Because there is less metal used this can make a ski slightly lighter, especially at the tips, which makes a ski easier to turn. However because the continuous length of metal is lost, the edges are not always as strong and it can leave the tips of the ski more prone to damage. On some skis the edges seem to continue around the tips, but these sections are made of a different length of metal, normally aluminium. This makes the tip and tail stronger without adding too much weight, but as the continuous length of metal is still lost, it is still not quite as strong as a full wrap edge. All the individual parts of a ski are held together with resin, usually epoxy resin. It is very important that the type and amount of resin are correct as this can effect the strength, weight and flex of a ski. Occasionally skis delaminate, which is where the different layers start to come apart, when this happens it's because the resin didn't bond the ski together well enough while the ski was being manufactured. Wax is applied to the base of skis so that they create less friction with the snow and can slide faster. The most important features of a wax are; to lower the friction coefficient between the base and the snow as much as possible, to be hard enough that snow crystals will not penetrate the wax and make the base grip the snow, and to repel water. There are 2 types of wax, hydrocarbon waxes and fluorocarbon waxes. Hydrocarbon waxes are paraffin based, and are the most common type of wax used. They penetrate the deepest into P-Tex bases and last the longest when applied with a hot waxing iron. Fluorocarbon waxes differ from hydrocarbon waxes in that they are made of carbon molecules with negatively charged fluorine atoms, as oppose to the neutrally charged hydrogen atoms in hydrocarbon waxes. This repels water and dirt better, reducing friction and making fluorocarbon waxes faster. Fluorocarbon waxes are generally only used by racers though, as they are expensive, and require more preparation to use. Normally a ski is waxed with a hydrocarbon wax first, and then if a fluorocarbon wax is being used it is applied on top. Waxes are designed for use with different temperatures of snow. There are many all temperature waxes intended to work in all conditions, but really they are just mid range temperature waxes. The main difference between the waxes for different temperatures is how hard they are. A harder wax creates more friction, so the softest wax possible wants to be used, but the wax still needs to be harder than the snow to stop the base material from gripping the snow and increasing friction. Colder snow is harder and requires a harder wax, whereas warmer snow is softer and wetter, and requires a softer wax with more hydrophobic additives to repel water better. For the average skier an all temperature hydrocarbon wax does the job perfectly well, and will give them a reasonably fast ride in all conditions. When a base slides along the snow, static charges are created which increase friction. Having a graphite additive in the wax helps conduct these charges away from the bottom of the base, producing better anti-static properties. This creates less static charges between the base and the snow, and therefore reduces the friction due to static electricity. On to the Ski Cambers page.